Perovskite oxide ceramics have found wide applications in energy storage capacitors, electromechanical transducers, and infrared imaging devices due to their unique dielectric, piezoelectric, pyroelectric, and ferroelectric properties. These functional properties are intimately related to the complex displacive phase transitions that readily occur. In this study, these solid–solid phase transitions are characterized with dielectric measurements, dynamic mechanical analysis, thermomechanical analysis, and differential scanning calorimetry in an antiferroelectric lead-containing composition, Pb0.99Nb0.02[(Zr0.57Sn0.43)0.92Ti0.08]0.98O3, and in a relaxor ferrielectric lead-free composition, (Bi1/2Na1/2)0.93Ba0.07TiO3. The (Bi1/2Na1/2)0.93Ba0.07TiO3 ceramic develops strong piezoelectricity through electric field-induced phase transitions during the poling process. 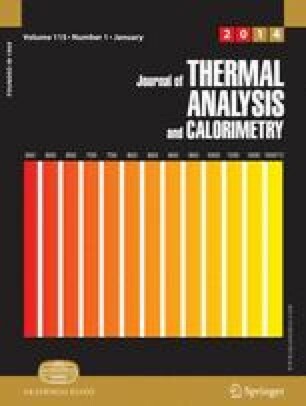 The combined thermal analysis techniques clearly reveal the differences in unpoled and poled ceramics. This work was supported by the National Science Foundation (NSF) through Grant CMMI-1027873. Basic research needs for electrical energy storage. U.S. DOE Workshop Report (2007). http://science.energy.gov/~/media/bes/pdf/reports/files/ees_rpt.pdf. Accessed 14 Mar 2013.